Fixed-route buses travel along a specified or fixed path, and riders can board and exit the bus at bus stops or flag stops along this path. Paratransit Service is a subscription service available to qualified individuals through an application process. OPT provides paratransit service for individuals who cannot access the regular fixed route buses and who meet the eligibility criteria. For more information or to request an application for this service, please call (607) 432-7100. 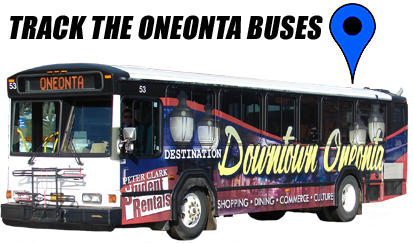 Paratransit service is described as a curb-to-curb service only. Drivers may provide assistance in boarding and disembarking the bus, but may not assist beyond this point. OPT’s paratransit service area is always within a 3/4 mile radius of it’s fixed route service. OPT’s paratransit service operates Monday through Friday, from 6:00 a.m. until 6:00 p.m.
Advance registration trip reservations will be accepted a maximum of 14 days in advance of the trip until the day before the trip. Trips must be scheduled by closing time the day before the trip. Standing reservations will be taken for those with a regular or daily travel need. Trip reservations are accepted during regular business hours, Monday through Saturday, 7:00 a.m. until 5:30p.m. Our phone number is 432-7100. All trip requests are filled on a first come, first serve basis, as space is available. There is no priority given based on trip type or rider type. Riders are picked up within a 30 minutes period (15 before and 15 after) surrounding their reserved time. All passengers must adhere to OPT’s policy on use of the wheelchair restraint system. Cancellations must be phoned in to the office up to two hours prior to the scheduled pick-up. No shows (individuals who do not appear for their scheduled pickup) are documented. Three no shows in the period of three consecutive months may result in suspension of eligibility.